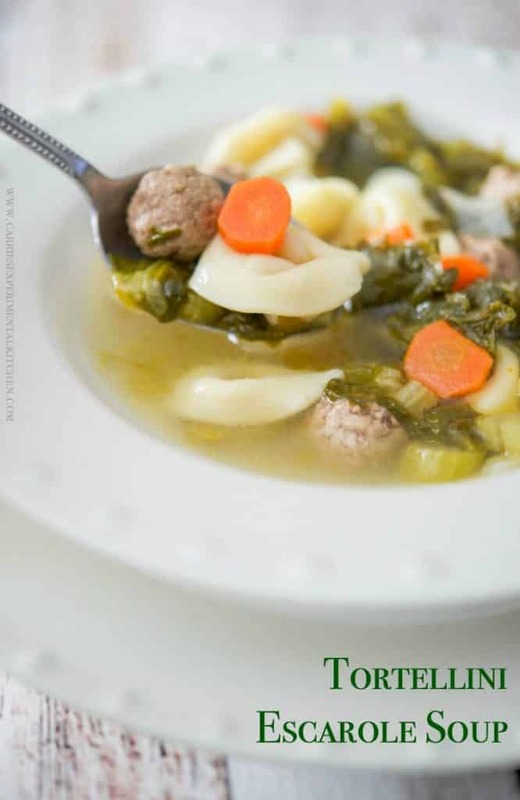 Tortellini Escarole Soup is my variation of Italian Wedding soup. It’s so hearty , that it’s more like a stew than a soup and perfect for a cold winter day. I’ve been making this recipe for Tortellini Escarole Soup for over 20 years and never shared it on the blog as it was in my cookbook. But I recently made a batch to keep in the freezer and I just had to share how easy and delicious it is. 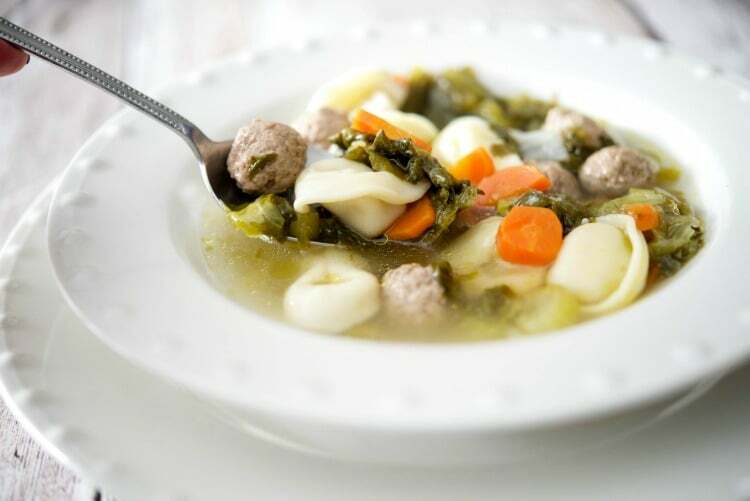 Tortellini Escarole Soup, or is also known as Italian Wedding Soup, is a popular Italian-American soup that consists of vegetables and meat in a clear chicken broth. 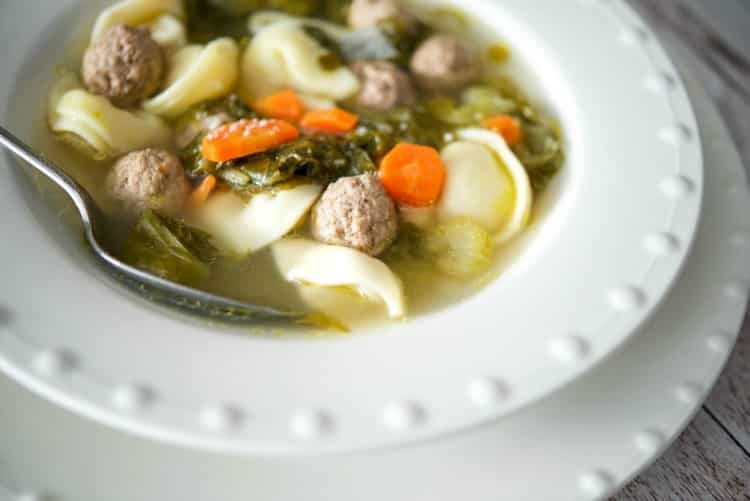 It’s a deliciously healthy soup that tastes even better the next day as the tortellini absorbs most of the liquid and becomes more like a hearty stew. Start off by sauteeing leafy green, chopped escarole, carrots, celery and onions; then add your chicken stock. I like to dilute my stock a bit with some water, but use all stock if you prefer. Next, roll the ground beef into little meatballs and drop them into the pot along with some grated Pecorino Romano cheese. You want to make them small, about 1/2-inch, so they are bite size. You can also substitute ground turkey, chicken or pork. Allow the meatballs to cook and the soup to simmer for about 1 hour; then add your tortellini and cook for another 15 minutes. The longer it sits, the heartier it becomes. My family likes to add some additional grated cheese on top right before eating with warm, crusty Italian bread. 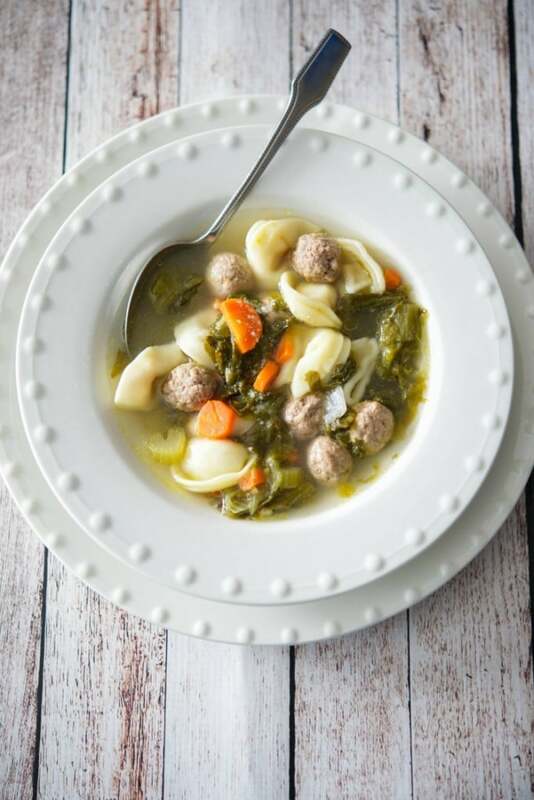 This Tortellini Escarole Soup is a definite family favorite all year long. ~Enjoy! 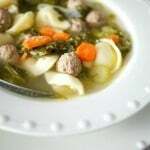 Tortellini Escarole Soup is my variation of Italian Wedding soup. It's so hearty , that it's more like a stew than a soup and perfect for a cold winter day. In a large pot, add oil and heat over medium high heat. Add chopped escarole, celery, carrots and onions and sauté until escarole becomes wilted. Next, add the chicken broth and water and bring to a rolling boil; reduce heat to a simmer. Form small, round ½” balls with the ground beef and add to the pot; then add the cheese. Season with salt and pepper and simmer for 1 hour. Add frozen tortellini and cook for another 15 minutes. You can also substitute ground turkey or chicken in place of the beef.